I’ve loved bow ties for as long as I can remember. In high school and college, I was secretly envious of all the guys who wore bow ties to dances. I obviously love a good cocktail dress, but there’s something so classic about a bow tie. My boyfriend has a few bow ties, and I would beg him to wear them in college for formals. Once he was on board, we encountered a pretty major roadblock: neither of us knew how to tie one. We spent thirty minutes watching YouTube tutorials until finally throwing in the towel and switching out the bow tie for a regular tie. Flash forward a few years, and my obsession is still going strong. I thought the holidays would be the perfect time to try out the tuxedo look for myself. Also, I bought these sequin pants last year and have been counting down the days until it was socially acceptable to wear them again. You can’t judge sequin pants in December. 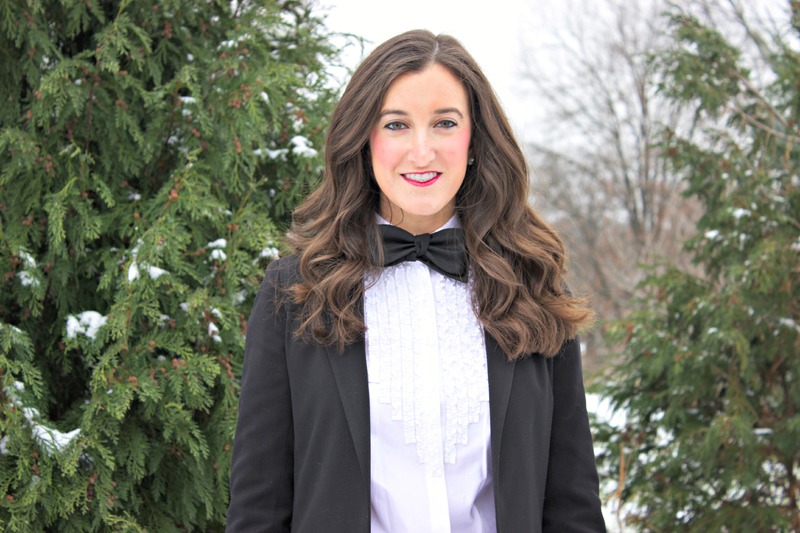 Once I had the basics of my female tuxedo, I still needed the main attraction: the bow tie. I looked for women’s bow ties, but wasn’t willing to splurge on the Saint Laurent options. That’s when I headed to the men’s floor at Dillard’s and found a classic black Cremieux version. Unfortunately, some things never change, and I failed miserably at the YouTube tutorials for tying a bow tie. Luckily, my mom saved the day and found a two minute video and then proceeded to tie the perfect bow. I’m 99% sure I’ll be wearing this for Christmas Eve or Christmas this year. After the holidays, I think I’ll pair this blouse and bow tie combo with my black leather skirt! After wearing it once, I’m convinced I could wear one every single day with a button down and blazer. Treetopia’s Merry Chic-mas + A Giveaway! You look fabulous!!! This look is so fashion forward and you pull it off like no one else! I looove how you made it feminine with the mary janes and the sequin pants. Perfection!! Thanks Christy!! I think it’s one of my favorite outfits I’ve worn. So glad to hear you like it! bowties are the BEST! love this menswear inspired ensemble! Those pants should be socially acceptable all year because they are amazing! I love this look. Haha I agree with you on the pants! Thank you! I love this look! It’s take lady-in-a-suit to the next level. You are killing it in those sequin trousers, too! Thanks Ashley! I couldn’t wait to bring out the pants this holiday! You did an amazing job with this menswear-inspired outfit! It’s a hard look to pull off but you look great! The sequin pants add the perfect amount of femininity. Thank you Grace! I was worried how it would turn out, but I’ve always loved the tuxedo look so I’m glad it turned out well! I love the tuxedo look with the red accents. You totally pull it off! Thank you Kristin! I appreciate it:) I just cannot resist anything with a bow! Sequins and a bow-tie, it’s like you just walked out of my dreams (in a totally platonic way of course)! LOVE this look Olivia! 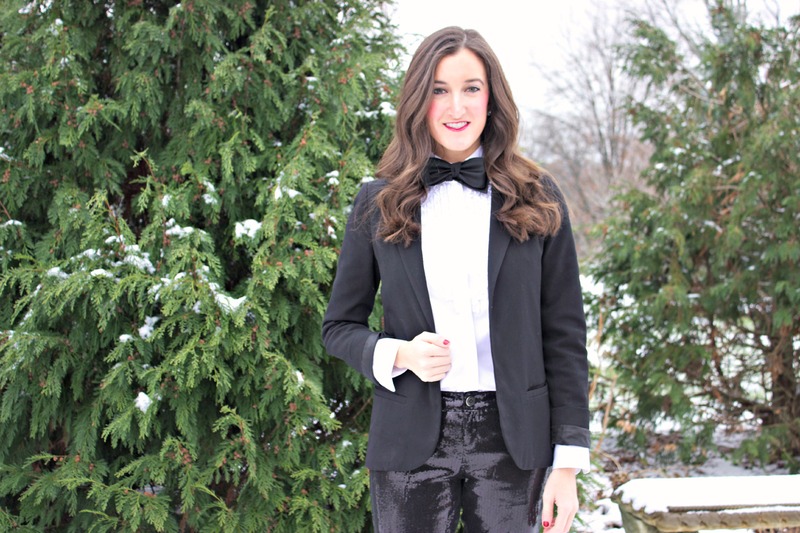 Totally making menswear look glam, and I am still SO obsessed with those sequin pants! Also, I literally had to call Bob over to the computer just now to show him proof that we are NOT the only couple who have turned to YouTube for bow tie help and failed miserably! lol It’s so much harder than it looks! Thank you Rochelle!! Hahaha that’s hysterical. You have no idea how relieved I am to hear I’m not the only one to YouTube bow tie tutorials. It’s impossible! I was seriously depressed in college when we had to give up. They’re so cute, but such a pain to tie! Something only you could pull off, I’m sure! Love the pop of color in your red nails. And what a gorgeous background!! Aww thank you Chloe!! I went to a park by my house to take these, and luckily was able to find the perfect Christmas trees! Girl you look amazing! You can pull off killer looks that few others can! I love how this is a fresh and unique take on a classic look! Simply amazing Olivia! Thanks Jen!! Appreciate it 🙂 I seriously love menswear-inspired looks, especially during the holidays! You are rocking that tuxedo! Look at all that snow… stay warm! Thank you Stephanie! Trying to stay warm, but this snow isn’t making it easy! 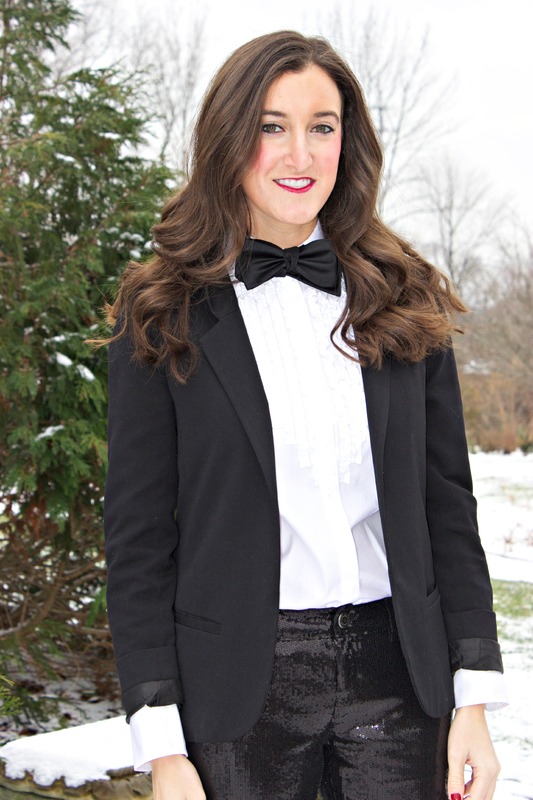 Olivia,you look very nice and stylish wearing your tuxedo and I like the look. Olivia,I like how you wear your tuxedo and you look very beautiful wearing it.I am going to buy the same tuxedo you are wearing for my girlfriend for a black tie party and we want to dress alike. Hi, Olivia, I’m a hugh fan of pretty women who wear tuxedos…and you look fantastic!! !